Subbing for DJ Yoko Eno's Totally Wired again. This time, I'm playing (just some) more of my favorite music from the past year that I couldn't fit into Friday's show. Still had to scramble to fit everything in since there was so much great music this year. Today is a 5-hour special, subbing part of DJ Lovebug's Alphabet Soup/For Fun & For Free Fridays. I'll be looking at some of my favorite music from this past year, as much as I can fit into a 5-hour set. There are also several songs that were either released late 2017, or past singles that were re-recorded or re-mastered for releases this year but I still loved them as much as the music released this year. In addition, links to some of these songs (via Youtube, Soundcloud, etc.) will be provided so you can enjoy them. Have a safe and wonderful celebration, and happy new year! Subbing for YOKO ENO. Playing some more holiday music, mostly in the Indie Rock/Folk range this time. New music from Les McCann, The Brian Jonestown Massacre & more. Playing a holiday set today, with some Christmas music and other wintery tunes. Plus new music and some late year-end additions from Khruangbin, Sufjan Stevens, Remington Super 60, Maison book girl, Men I Trust, Macra Izumi, Gutevolk & more. Next week will be a 5-hour Best of 2018 special from 7am-noon, subbing part of DJ Lovebug's show. I hope you do join me earlier next Friday. Merry Christmas / Happy Kwanzaa / Happy Holidays! Motivational and graduation music for the final day of exams and end of semester. Also featuring music from some of 2019's inductees for the Rock and Roll Hall of Fame, and new additions from Mogwai, Harvey Sutherland, Georgia Anne Muldrow, Earl Sweatshirt, Jessica Pratt, Copeland, The Japanese House & more. Playing some calm Jazz and Ambient music for the first half of the show in preparation of final exams next week. Best of luck to everyone studying for finals! New additions this week from Joe Locke, Piet Verbist Quartet, Grouper, Tirzah, SOPHIE, Little Dragon, Toro y Moi, Vivian Sessoms, & more, along with a couple of Buzzcocks classics in tribute. Subbing for DJ SuperCute this week. More Rock-oriented set with some Indie Dance thrown in between, including recent releases I've been needing to catch up on. Subbing in for Mild Mannered DJ Bryan, who is out celebrating his twins' birthday. Happy birthday to Kenzi and Kira! New music today from Fox Capture Plan, The 1975, Seventeen Years Old and Berlin Wall, We Are the Night & more. New additions this week from Jay Thomas with the Oliver Groenewald Newnet, Mr. Twin Sister, Avantdale Bowling Club, Shad, George Clanton, Harukatomiyuki, Homecomings, Peterpan Complex & more. Playing some new and semi-new music on this holiday weekend from Ellis Marsalis Quintet, Sons of Kemet, Tsukuyomi, Mid-Air Thief, Rival Consoles, Yves Tumor, HUS, Last Dinosaurs, Anderson .Paak, Ross From Friends, Friendly Fires & more. Played more of a modern Jazz set for the first part of the show today. Lots of new music this week from Eiko Ishibashi, Sade, Thundercat, Alfa Mist, Abstract Orchestra, Julia Holter, Cut Copy, Nagi Yanagi, Azure Ray, DAOKO, Yaeji & more. Thank you to everyone who either donated, or called in to drop some requests today. This Minithon mostly focused on the 50th anniversary event coming up sometime next year, and I have been honored to have been part of this station for 5 years of it. It means a lot to me, and I am grateful to everyone who has listened. This Minithon will last until Sunday November 11. Stay tuned to the next Radiothon coming up in Spring. Along with some of my current favorite Jazz and Soul tunes (old and new) and listener requests, I also got to fit in a couple of new music from Charles Bradley, SOIL&"PIMP" Sessions, Garcia Peoples & more. John Coltrane - A Love Supreme Part I: "Acknowledgement"
KTUH's Minithon, a smaller version of the spring Radiothon, will be going on from November 5, starting at 7am and ending at 9pm each day during the event. 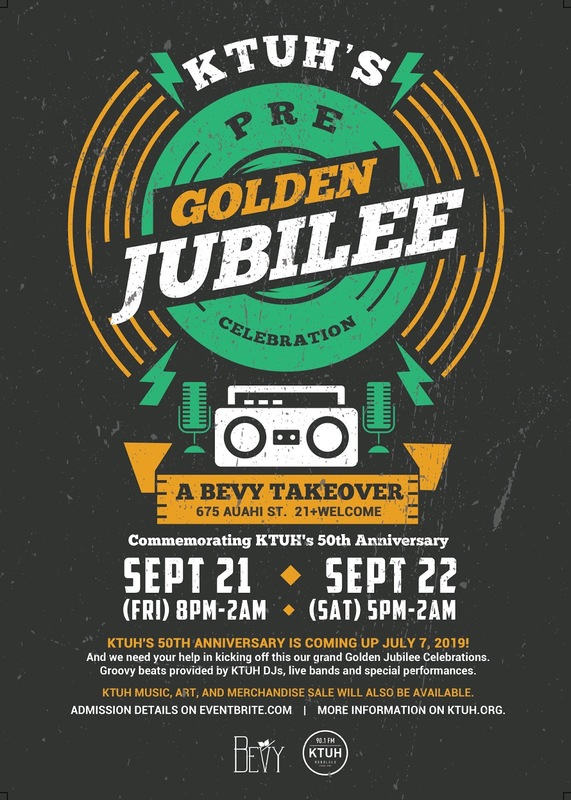 We will be raising money to prepare for KTUH's 50th anniversary in 2019, in addition to funds for equipment maintenance and everything we need to keep the station running. Minithon will take place until November 11 or if we reach our goal before then (in which KTUH will return to regular programming). More information can be found on KTUH.org. Featured new music from Kelly Moran, Ambrose Akinmusire, Yussef Dayes & Alfa Mist, Unknown Mortal Orchestra, Primitive Art Orchestra, Eli Keszler, Makaya McCraven, Little Dragon, Skylar Spence, Beach House, Washed Out & more. Preparing for Halloween by playing some dark themes (at least what I can play in the daytime) along with some fun spooky music. Plus new releases by Ichiko Aoba, Lights & Motion, Thom Yorke, Esperanza Spalding, Cloud Nothings & more. First half of the show focuses mostly on Jazz guitarists, from acoustic guitars to Brazilian legends. Plus an interview halfway through the show with Cuban pianist Harold López-Nussa as conducted by KTUH's DJ Barbie (currently Sun. mid-3am). Harold will be visiting Maui and the Big Island, concluding with a performance at the Kahilu Theatre in Waimea on Saturday, October 20. Showcased new music by St. Vincent, Sampha, Low, Beach House, Shlohmo, Minus the Bear, Fox Capture Plan & more. Also featured a track by Pat Metheny, who will be performing at the Blue Note on October 29 & 30, and a couple from Kool Keith a.k.a. Dr. Octagon, who will be performing at Hawaiian Brian's on Thursday, October 25. Interview with Harold López-Nussa, conducted by DJ Barbie. A couple of traditional pieces featuring the shakuhachi found in KTUH's recent arrivals library, plus new music from BADBADNOTGOOD with Little Dragon, Sam Wilkes, Tim Hecker, Perfume, Shigeto, Kikagaku Moyo, Spiritualized, mewithoutYou & more. A couple of works from recording engineer Geoff Emerick (The Beatles, The Zombies, Elvis Costello, Kate Bush, etc.) in tribute, and a little bit of an atmospheric/Jazz set going for the first half of the show. Thank you to everyone for the requests and feedback! Also played several songs in response to this morning's depressing news. Despite everything, I hope everyone is having a safe weekend. We are celebrating College Radio Day at KTUH. And excellent news for once; my Friday on-air colleague Mike Curtis just passed his Bar Exam. Congratulations! New releases (and semi-new music from the KTUH library) from David Garfield, Thom Yorke, Kairos Sextet, Al Di Meola, Ruby Velle & the Soulphonics, Cursive, Kero Kero Bonito, Yumi Zouma & more.